I began dropping down during my first full season in 2005. Being a bullpen pitcher requires the ability to pitch everyday (something I was not accustomed to as a starting pitcher). As I dropped my arm angle, I realized that I maintained good velocity, increased movement, and it was easier for me to bounce back and pitch everyday. In addition, I felt like hitters (in particular RHH) were much more uncomfortable against me with my lower arm angle. I would say that my arm angle made it much harder for hitters to see the ball clearly. In addition, I had great sinking action on my fastball from a lower arm angle. It's tough to say. I had better velocity and less movement from a higher arm slot. I am very happy with the success that I had from my lower arm angle. I would tell them to compare the advantages/disadvantages. Also, it really depends on the type of stuff you have from changing your arm angle. If dropping your arm angle makes you a much better pitcher, I would say go for it. 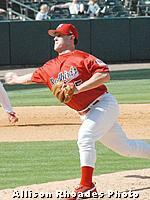 A pitcher that drops their arm slot still has to implement many of the same ideas that a traditional pitcher has to. For example, releasing the pitch out in front in order to maximize pitch velocity/movement. In addition, all pitchers adjusting to a new arm slot need to learn themselves and allows them to maximize their pitches. This process comes with time and repetition from practice. I threw a two-seam fastball, slider, and occasionally a change-up. To the majority of RHH I would try to get ahead with two-seam fastballs (in) and use my slider (away) as my out pitch. To LHH I would use my two-seam fastball away the majority of the time and show in for effect. I would throw my slider away (back door) or on their back foot when I was ahead in the count. In addition, I would mix in my change-up when I felt like a hitter was really on my fastball. I really liked being able to dominate RHH. The majority of RHH that come to the plate against a low arm angle RHP are already dreading their at-bat. The different arm angle and inability to immediately pick up the pitch causes them to have a negative thoughts in their head before they even step to the plate.